While most people tend to get a bit frustrated with their “free from” cookie baking results, if you keep these 13 tips (A Baker’s Dozen!) handy next time you’re baking cookies, you’ll be baking your way to moist, chewy success! 1- Cream the butter or shortening with the sugar with an electric mixer before doing anything else. This step will help whip up the butter or shortening and make it fluffier, while also breaking down the sugar a bit, so that it doesn’t melt as much (e.g. spread) when baking. 2- Bake with a combination of butter (or non-dairy butter alternative – i.e. Earth Balance® Buttery Sticks — NOT spreads because they … spread!) and shortening, rather than just butter alone. The combination works to give more body to the dough to prevent spreading. To see more on the benefits of this combination, see my video! 3- Cover cookie sheets with parchment paper for every cookie recipe. It prevents the cookies from sticking to the sheet (and then breaking apart when removed), doesn’t leave a greasy aftertaste on the bottoms of the cookies, and helps you spend less time in the kitchen doing clean-up duty when you’re done! 5- Don’t put too many additions into any cookie recipe. For example, with chocolate chip cookies, adding too many chocolate chips will cause the cookies to spread, as there is not enough dough to bake up for support. This is one reason why I like using Enjoy Life® MINI chips (and they’re dairy, soy & nut-free, too!). 6- If your cookies still insist on spreading, add 1/4 cup of gluten-free flour to the remaining dough to help hold them together (also helps at high altitude!). 7- If your cookie dough is too dry and crumbly, just add back to the mixing bowl and stir in a couple tablespoons of your favorite milk. Add more if needed – the dough needs to hold together, but most cookie doughs shouldn’t be sticky. Sometimes I’ll keep cookie dough in my fridge or freezer and when I go to bake some, the dough has dried out from the cold. Same solution: bring to room temperature then mix in a few tablespoons of milk. Voila – cookie dough like new! 8- Baking by weight, as opposed to volume, is always more accurate. One measured cup of my gfJules™ All-Purpose Gluten-Free Flour should weigh approximately 135 grams. Measuring your ingredients inaccurately can throw any recipe off, especially finicky cookie recipes! 9– If your oven has the option, bake using convection settings, rather than static temperature. If you have a convection setting on your oven and a convection temperature is not given, simply reduce the static temperature by 25 degrees when using your convection setting. 10- In fact, go ahead and reduce the temperature on your oven by 25 degrees anyway. If your oven is baking too hot (shockingly, most ovens don’t cook at the accurate temperature! ), your cookies will definitely spread! The sugar in the dough may even sneak out the sides of the cookie and form a lacy texture. If this is happening, try baking the next batch at a lower temperature and see what works best with your oven. 11- Take your cookies out BEFORE they look done. With chocolate chip cookies, for example, I remove them when the centers still look a bit doughy. As they cool, they are still cooking. Taking them out of the oven at this point will ensure that they stay chewy! 12- Let your cookies cool before removing them from the parchment. I slide the parchment onto wire cooling racks after 5 minutes or so, and let them fully cool before I remove them. Once they’re cooled, they are no longer fragile … but still chewy and delicious! 13- Make sure your baking soda and/or baking powder are fresh. These are the leavening agents in your cookie recipe and if they are no longer active, your cookies won’t puff up and may spread more. Try a fresh container if they’ve been open longer than 3 months. Also try my delectable and uber-versatile award-winning gfJules™ Cookie Mix and my easy gfJules™ Sugar Cut Out Cookie Mix! And don’t forget homemade graham crackers! I have a mix for that, too! 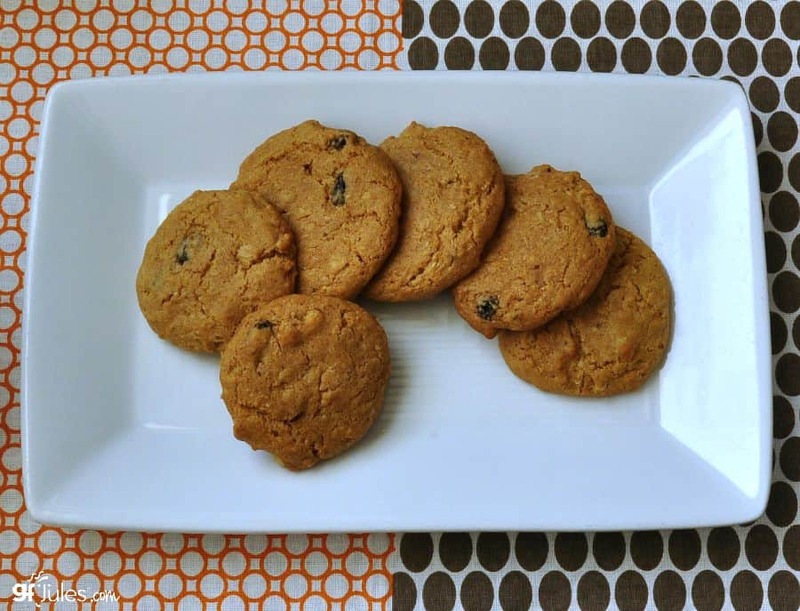 And don’t forget to sign up for all things Gluten-Free Cookie by joining the Gluten-Free Cookie Swap – your community cookie recipe share site! Hi Jules, do you know if there’s a way to make brown butter chocolate chip cookies gluten free? I’ve tried four times, and each batch either spread out, making essentially cookie brittle, or just fell flat once they came out of the oven. I take your point about creaming the butter with the sugar, and will definitely try going back to basics, but I love the nutty, caramelized taste of the brown butter recipes and really want to re-introduce it back into my repertoire. Think it can be done? Thanks! Hi Sarah, based on what you’re telling me about the results, I’d suggest revisiting your brown butter recipe but adding more of my GF flour. Start with 1/4 cup more and see if that’s enough with just baking a few cookies so as not to waste the dough; if not, add another 1/4 cup to the remaining dough and test that. Also refrigerate the dough well before baking and use parchment. Let me know how it goes! I just used your new (to me) program for printing, it is fantastic and I think every site should use it. Great choice! Great, Virginia! Glad it’s worked out for you! I used Jules gluten free flour for the first time in a pound cake. The recipe calls for sifting the flour first, which I did. The cake rose (not as high as with flour), but then it rather collapsed. Could it be from sifting the flour? That shouldn’t have an effect, Rhea, but if it meant that the flour wasn’t measured accurately, that could certainly cause the cake to fall. If you have a food scale, measure 1 cup of my flour to 135 grams to be sure you have the accurate measurement. Otherwise, I’d say add an extra 1/4 cup of my flour to this recipe next time to help give it more support. I am trying to make my mother in laws cookie recipe with your AP flour. They keep coming out flat. Crispy. And I am getting frustrated. I added more flour. But I still can’t figure this out. I have had great success with cakes and meals but these cookies are hard to get right!!! Your help would be appreciated. Should I not try to convert a regular recipe to GF??? Hi Peris, I’m sorry you’re having trouble converting that particular recipe. The easiest way to help you get it right is to communicate via email. Send an email to [email protected] and we’ll walk through the recipe with you to see if we can figure out how to get it just like you like it! I LOVE your flour for everything I make. I have successfully turned my mother’s chocolate chip cookie into gluten and egg free using Bob’s red mill all purpose. When I use your flour they spread and are not edible. What am I doing wrong? I just discovered your products. I received the “New To Jules Gluten Free” flour, cookie mix, cornbread mix, and e-books. I can’t wait to try some of the products this weekend. I enjoy baking; my non-celiac family often tell me they are not interested in trying my cookies and cakes. I imagine there will be rave reviews by the comments on this blog! Thank you for the informative website. Beth – I look forward to hearing about all the goodies that your family will be loving, without even knowing they are gluten-free! I know you will love them too – welcome to our family!!! I mix up oatmeal cookies and leave them overnight in the fridge. I am able to add dried cranberries, raisins, walnuts and flax to the original recipe with no “spreading” issues at all. I have actually left them up to 24 hours and they cook up fabulously and are always moist. Even family members who are not GF love these cookies. My daughter and I just finished making the Christmas cut out cookies. Absolutely delicious! Her Christmas baking is now complete! Thanks Jules for the great flour mixture. Anxious to make some blueberry muffins next and maybe an Angel food cake. I just made your sugar cut-out cookies, and they turned out divinely! I never thought I would be able to eat Christmas cookies again at parties, and now I have a recipe that I can bring! Thank you so much! Yay! So glad you have Christmas cookies back in your life to enjoy and to share!!! I just made your Hamanashen Cookies. What is the best way to store them? Can they be frozen for eating a future date? 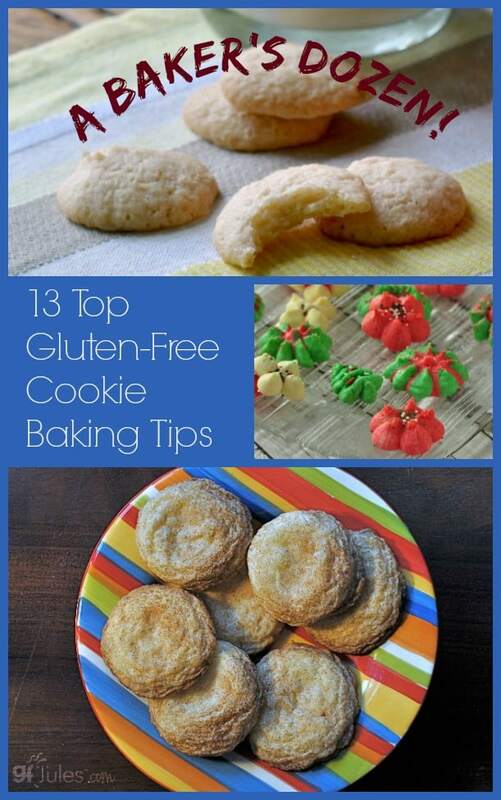 Thanks for all your gluten free baking tips! I love your recipes! So glad you tried the recipe and that you’re putting my tips and recipes to good use! You can certainly freeze them if they are wrapped tightly – I never recommend refrigeration, though, as that just dries out recipes. Enjoy! 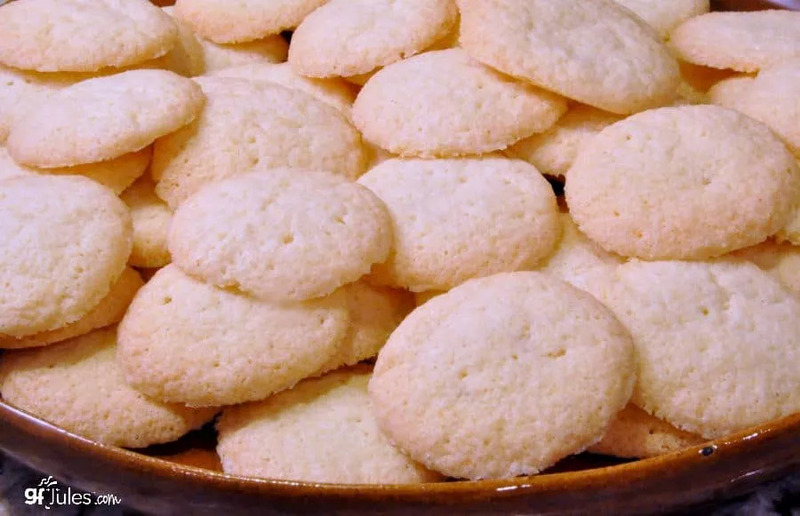 I would like to add a tip… cookies that are placed in a covered container within 20 minutes of baking tend to stay softer, if soft cookies are what you prefer. After I partially chill the cookie dough, I lay out 5 or 6 sheets of saran wrap and divide the dough between them and roll them each into a cylinder. Place back in fridge or freezer and just slice and cook when needed. Works much better than wrestling with frozen chunks of dough!!! Roselyn, I’ve tried that trick before too. It’s awesome! I use it especially for peanut butter cookies because then I can slice them to be flat and just press the fork into them for the pattern. Much faster! Thanks for the tips! I have little boys who love cookies so I need to figure this out! More great tips. Thank you! After trial and error, we found that adding more flour was often the key to success. For the butter / shortening blend – do you recommend a 50/50 mix or some other variation? Helen, I start with a 50:50 ratio, but will sometimes modify, based on results. Great suggestions…I never thought about chilling the dough before baking. Congratulations, Wendi! You are our Blog Hop winner! Look for an email from us – we need your address to ship your prize: one 5lb bag of my Jules Gluten Free All Purpose Flour! Thanks for all the tips! Now I know what to do if something goes wrong. I haven’t had a cookie since I went gluten free, but haven’t really missed them yet. I know that will change once Christmas gets here, though.